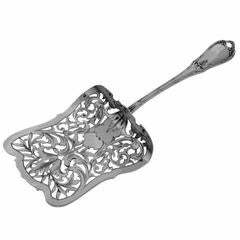 Exceptional asparagus, pastry or toast server in sterling silver. The sophistication of this design and the quality of workmanship is typical of that of the Maison Puiforcat. 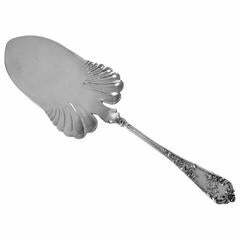 The curved blade has pierced and engraved with a sophisticated foliage and asparagus decoration. Once again, the Maison Puiforcat shows that it is one of the most prestigious silversmith of the world. No monograms. Head of Minerve 1 st titre on handle for 950/1000 French sterling silver. Silverplate upper part. Prestigious silversmith: Emile Puiforcat who has impressed his personality on the world of jewelry. 16 rue Chapon - Paris, was active from 1857. The haute couture of the silversmith: Since its inception Puiforcat has worked to produce only works exceptions, carefully shaped by craftsmen with the fingertips art to sublimate the material. With a glorious past, current choices demanding and daring, and a desire to retain the silverware at the highest level of quality. Like Saint-Louis crystal company, Puiforcat belongs to the famous luxury Hermes Group. Measures: 10"9 (27.7 cm). Weight: 166 grams. The condition is very good. Micro-scratches from normal use. A master silversmith made a complete cleaning and polishing. Exceptional in both design and execution, this fabulous server will grace your table and will delight your guests. Shipping & Insurance Information : Sales only by shipment. SHIPPING WORLDWIDE with Priority Package Express International We deal with original genuine antiques over 100 years old. This piece is not subject to import tax to the US. We ship purchase Mondays through Friday ( outside french holidays ) paid items will be shipped on the first shipping day after payment is received. After registration of your order and confirmation of your payment, your order is prepared and packaged with the utmost care to ensure you receive the items in perfect condition. Your package will be insured for the total value of your purchase (s). Tracking numbers (French and international) of your package will be sent by e mail to track your package online on the french website then on the website of postal service in your country. This handy, sterling silver toast rack is usable up to 6 slices. Of course it would also be suitable as a napkinholder.